As everyone saw, Luis Severino–easily the biggest Yankees young pitching hope–got lit up by the Rays on Sunday afternoon. This continued Severino’s trend of getting rocked as a starting pitcher in 2016. What’s there to do about Luis? First, we really have to examine his numbers from this season. After dominating down the stretch as a rookie in 2015 (2.89 ERA, 8.1K/9 in 62.1 innings), Severino made the rotation out of spring training in 2016. Almost immediately, it went horribly wrong. From April to mid-May, Severino made seven starts and lost six of them (the Yankees lost all 7). Sometimes a loss isn’t the starting pitcher’s fault. Bad offense, or bad defense, can saddle a good pitcher with a tough defeat. This wasn’t the case for Luis, who put up a ghastly 7.46 ERA with 8 home runs in just 35 innings of work. Sheesh. After his May 13th implosion against the White Sox, the Yankees put Severino on the DL with a mild triceps strain. When he got healthy in June, the Yankees kept him in AAA to get him some confidence back. That seemed to work pretty well, as Severino went back to feasting on AAA hitting. In 11 starts, he pitched 66.2 innings with a 3.11 ERA with only 4 home runs allowed. As the trade deadline neared, the Yankees brought Severino up again, but this time to serve in a bullpen role. This seemed to reinvigorate the youngster, and he pitched to a 0.00 ERA in 8.1 innings with 10 strikeouts. Because of the quick-hit nature of relief, Severino was able to really leverage his high 90s fastball and his disgusting slider. When Ivan Nova was traded, Severino was put back into the rotation. Unfortunately, he went back to his old pitching ways, and was knocked around by the Red Sox. The Yankees sent him back to AAA, but an injury to Nathan Eovaldi led to an immediate recall for Luis, and he started again on Sunday. It was a complete disaster, as the Rays knocked him all over the field. It is apparent that Severino will not make his next turn in the rotation, although the Yankees haven’t officially announced it. So now what? Do the Yankees send Severino back to AAA until September? Do they send him to the bullpen, where he pitched well for a stretch? Does that bullpen move become permanent? Do they try to get rid of him? Well, the answer to that depends on how serious the Yankees are about winning this season. One thing is for sure, I don’t think Severino belongs in the big league rotation right now. The question becomes whether he keeps starting in AAA, or goes to the major league bullpen. I think Severino has the tools to be a successful major league starter and, at just 22 years of age, he should not yet be banished from this role completely. The league has clearly adjusted to him, and now he must readjust to these hitters if he’s going to be successful. I would be OK with whichever decision the Yankees made, but I’d like to see Sevvy stay in the major league bullpen. He can face major league pitching and work with Larry Rosthschild, who is the best pitching coach in the organization. I don’t think Sevvy would benefit from getting more AAA hitters out. We already know he can do that. One thing I would make sure to do, though, is to send him to either the Arizona Fall League or some kind of winter baseball league… possibly both. Severino needs experience and coaching, and I think the Yankees should have him pitch as much as possible (without going over his innings limit for the year, of course). As for 2017, I don’t expect the Yankees to fully contend. Why not give Severino another chance to stick in the rotation to start the season? If he falters by May again, the Yankees have plenty of AAA guys that will benefit from a temporary call up. If, by 2018, Severino still hasn’t been able to be a successful starter, then maybe that’s when you move him to the bullpen. After all, many of the best relievers of all-time were failed starters. The future Hall-of-Famer the Yankees honored on Sunday–the man considered to be hands down the greatest closer in the history of the game–was once just a guy who flunked out of the rotation. Could Severino be the next Mariano Rivera? Probably not, but he could be the next Andrew Miller or Dellin Betances–both also failed starters. 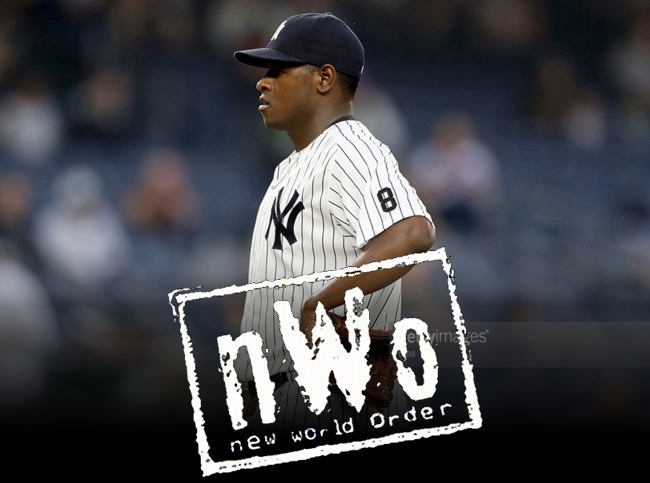 I still think the future is bright for Luis, and I look forward to his ascension to the New World Order of the New York Yankees–whether its in the rotation or not.